At the heart of Windows 7’s vastly improved search feature sits the index. 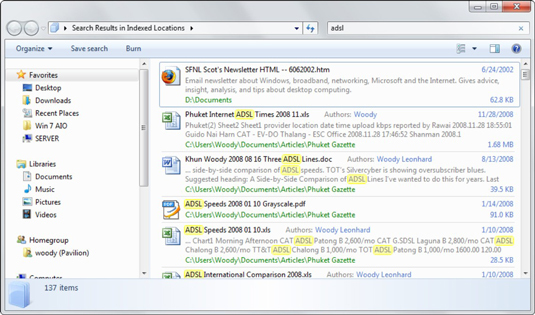 The Windows 7 index stores references to the contents of the computer. You can greatly speed the search process by adding all your storage locations to the Windows 7 search index. Want to add more folders to the index? That’s a common situation for advanced users, who might store indexable files in locations other than in the Documents library. Choose Start, immediately type index, and press Enter. Click the arrows next to the drives that contain the folders you want to add. You can add folder to the index only if it is on your PC. You can’t manually add networked folders. Select the check boxes next to the folders. When you’re done, click OK.
Windows 7 wheezes and moans and indexes the locations you picked. The easiest way to add a folder to the index is to simply add the folder to a library. Choose Start→Documents (or Music or whatever), click the Library Locations link in the upper-right corner, and add the folder. The folder you add can be on your PC or on the network.